Sgt. Matthew Haase, right, and Air Force Staff Sgt. 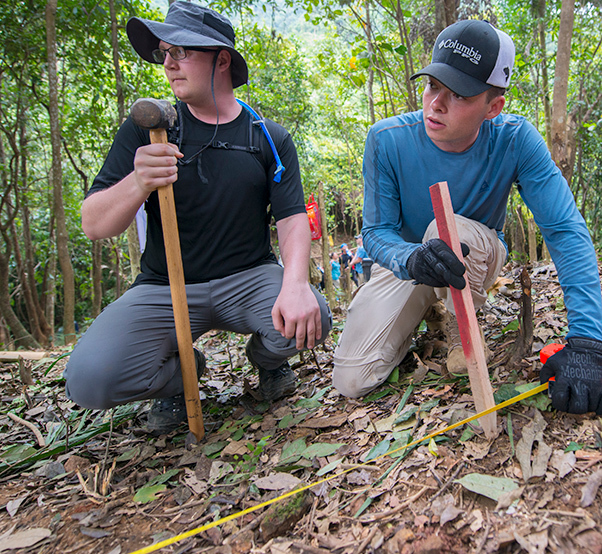 Tyler Trusty help line up a grid at a recovery site March 17, 2018, in Quang Ngai province, Vietnam, where an American pilot crashed during the Vietnam War. 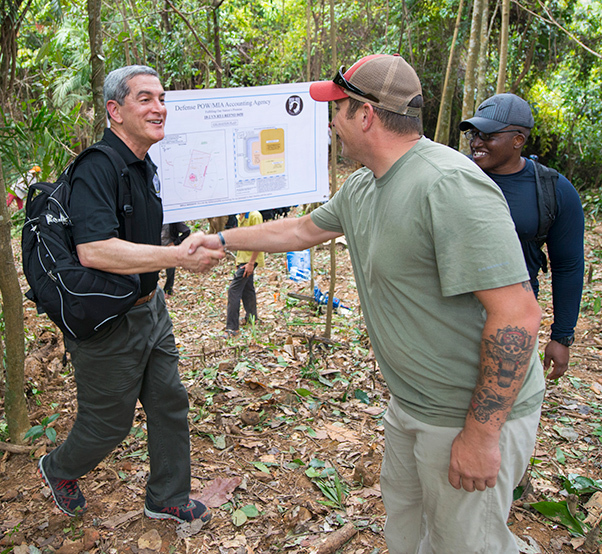 Members of a recovery team assigned to the Defense POW/MIA Accounting Agency lived in tents for 30 days and hiked up to the site every day as part of the mission. QUANG NGAI PROVINCE, Vietnam–The day Sgt. 1st Class Tommy Murphy died is still ingrained in his daughter’s mind. It was April 7, 2001, and Tycoria Johnson was just 9 years old. On that Saturday, Murphy, along with six other American service members and nine Vietnamese counterparts, departed on an MI-17 helicopter to investigate a potential recovery site. They were part of a Defense POW/MIA Accounting Agency mission in search of the remains of fallen service members from the Vietnam War. Her father was a team sergeant, she said, who supervised and did much of the planning for the team. But as the weather worsened, the helicopter veered off course and collided into a mountain hidden by clouds in central Vietnam. No one survived. Johnson, now a senior Airman based in Japan, recently volunteered for a joint mission with DPAA, where her father once worked as a mortuary affairs specialist. 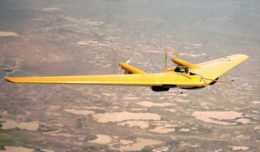 With her skills as a radio communications operator in the Air Force, Johnson was sent to Quang Ngai Province — not far from her father’s crash site — to augment a recovery team. Sgt. 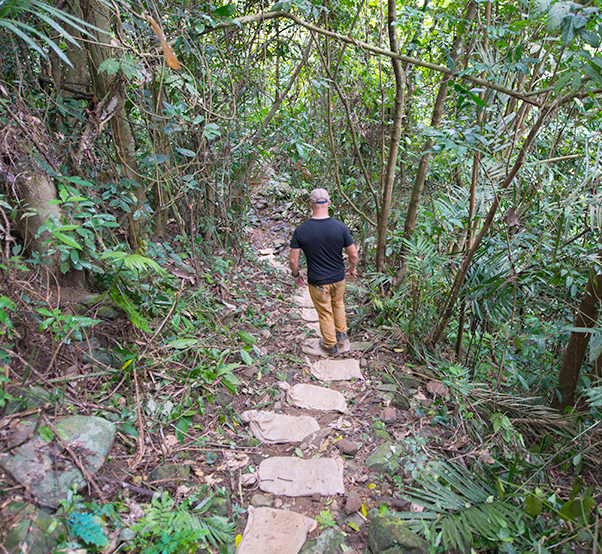 1st Class Zachary Plante, a recovery team member with Defense POW/MIA Accounting Agency, treks through the jungle to an excavation site March 17, 2018, in Quang Ngai province, Vietnam, where an American pilot crashed during the Vietnam War. Plante, along with other combat veterans on the team, often remember fallen Soldiers at their previous units as extra motivation during the mission. Atop a small mountain covered in a thick jungle, the team’s goal was to find a Marine pilot lost after his A-4E Skyhawk attack jet had crashed there during the war. “You feel that you’re a part of something bigger [than yourself],” she said at the excavation site in mid-March. For about a month, her team lived in tents lifted slightly above muddy, rocky terrain on plywood platforms. The humid heat stifled the air as insects and dangerous creatures, such as snakes and scorpions, lurked nearby. Each day, team members climbed 700 feet in elevation along a half-mile trail back up to the site. While it can take months, even years, to find remains that lead to the identification of a missing service member at these sites, team members understand why they still do it. 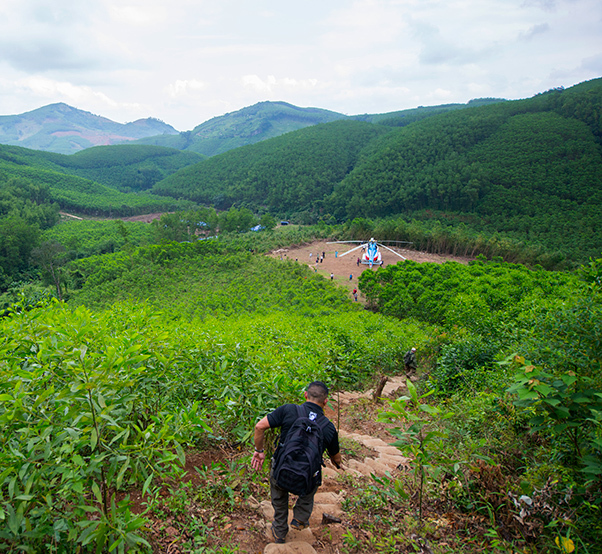 A member of the Defense POW/MIA Accounting Agency hikes a trail down from an excavation site March 17, 2018, in Quang Ngai province, Vietnam, where an American pilot crashed during the Vietnam War. A joint recovery team climbed 700 feet in elevation along a half-mile trail every day to the site as part of the mission. Sgt. 1st Class Zachary Plante, the mountaineering expert on Johnson’s team, spoke of the deadly encounters his unit saw in Operation Hammer Down while deployed to Afghanistan with the 25th Infantry Division. The air assault offensive in June 2011 was supposed to last about a day, he said, but it turned into a weeklong battle with Taliban fighters. While some of his fellow Soldiers did not make it out alive, they did return home, even if in a flag-draped coffin to comfort mourning friends and family. In his fourth recovery mission with DPAA, Plante said those memories continue to motivate him to recover as many Americans as possible. In Vietnam, there are more than 1,200 still missing. “We all lost people downrange, but we saw them come home,” Plante, 40, of Orange, Massachusetts, said. Similar events also weigh on Sgt. 1st Class Christopher Krogman, the team sergeant, who has deployed five times and lost Soldiers in combat. 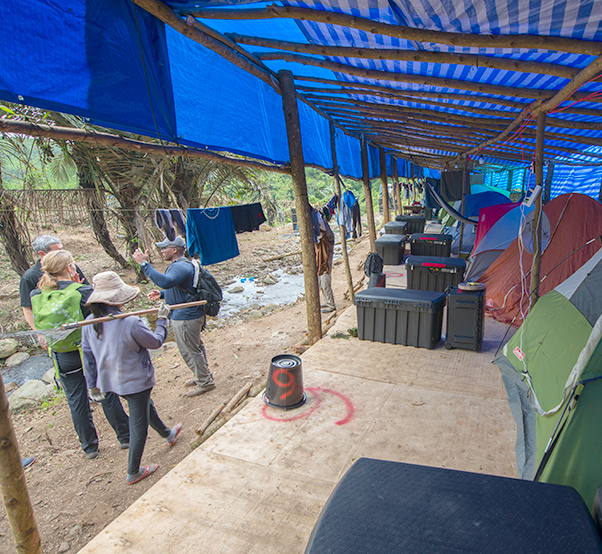 A row of tents sit on plywood platforms at a base camp near a recovery site March 17, 2018, in Quang Ngai province, Vietnam, where an American pilot crashed during the Vietnam War. Members of a recovery team assigned to the Defense POW/MIA Accounting Agency lived in the tents for 30 days and hiked up to the site every day as part of the mission. Living in the middle of a jungle surrounded by mountains also gave team members a new appreciation for what Vietnam War-era troops endured in their fighting. For the most part, the team looked past the uncomfortable times and to the overall purpose of the mission. Kelly McKeague, director of the Defense POW/MIA Accounting Agency, left, shakes hands with Sgt. 1st Class Christopher Krogman, the recovery team sergeant, at an excavation site March 17, 2018, in Quang Ngai province, Vietnam, where an American pilot crashed during the Vietnam War. Krogman, along with other combat veterans on the team, often remember fallen Soldiers at their previous units as extra motivation during the mission. Johnson needed perhaps the least convincing to drive on with the mission. When her father and the 15 others died in that helicopter crash, it had a devastating ripple effect across the entire agency, where many of them worked. Both the incoming and outgoing commanders for the detachment in Vietnam were also on the helicopter. At the time, a recovery team in Laos was about to leave the country when DPAA officials asked some of them to divert to Vietnam and help recover the bodies of their fellow team members. 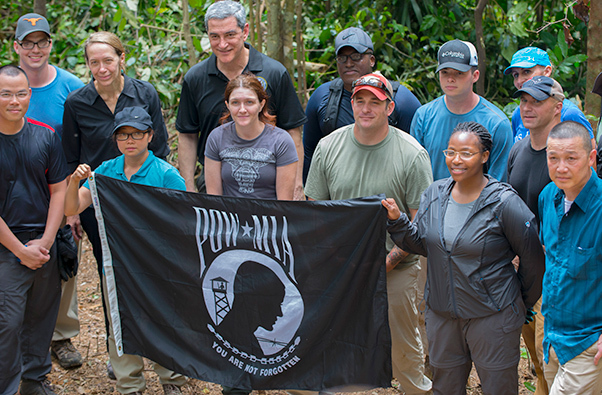 Kelly McKeague, director of the Defense POW/MIA Accounting Agency, left center in the second row, poses for a photograph with recovery team members March 17, 2018, at a site in Quang Ngai province, Vietnam, where an American pilot crashed during the Vietnam War. Air Force Senior Airman Tycoria Johnson, second from right in the first row, followed in the footsteps of her father, Sgt. 1st Class Tommy Murphy, who was killed along with other DPAA members in a helicopter crash in Vietnam in 2001. Webb said Johnson’s father was one of his good friends. He recalled that he and others in the office nicknamed him “gentle giant” because of his muscular frame. Before Johnson left for Vietnam, Webb had the chance to speak with her at the agency’s headquarters in Hawaii. Johnson plans to attend a memorial ceremony Saturday at the crash site, where a plaque is now on display honoring those who were killed, including her father. 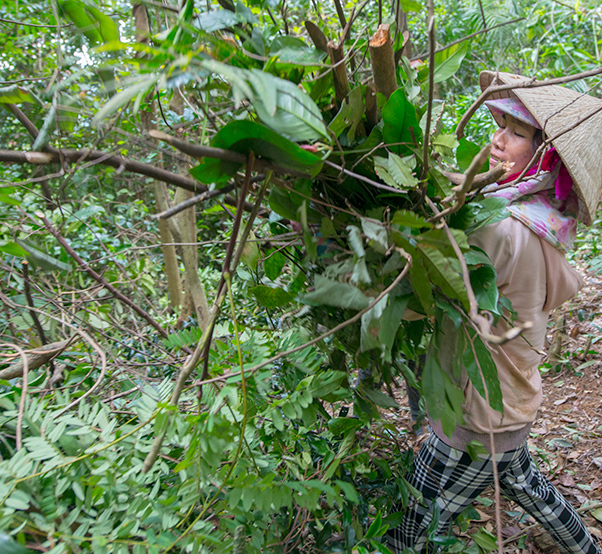 A Vietnamese worker clears jungle vegetation from an excavation site March 17, 2018, in Quang Ngai province, Vietnam, where an American pilot crashed during the Vietnam War. Sgt. 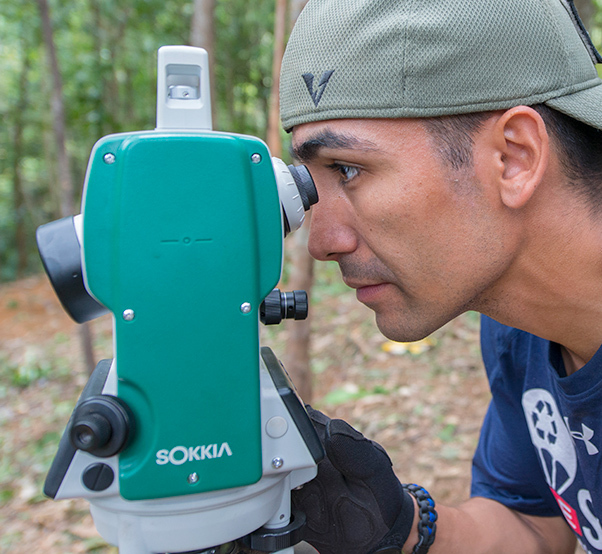 1st Class John Perales uses surveying equipment to help line up a grid at a recovery site March 17, 2018, in Quang Ngai province, Vietnam, where an American pilot crashed during the Vietnam War. 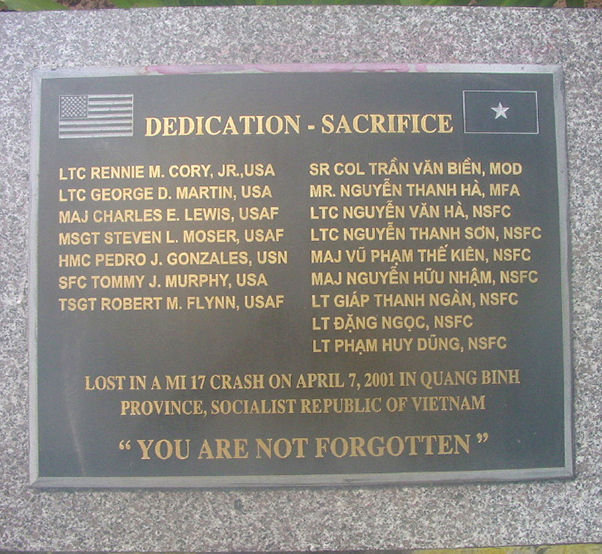 Memorial plaque for Sgt. 1st Class Tommy Murphy and 15 others who were killed in a helicopter crash in Vietnam in 2001 while conducting a mission for the Defense POW/MIA Accounting Agency.